Content distribution over the internet has come of age, according to Arqiva, with broadcasters and media providers embracing the channel as a true alternative to dedicated fibre, MPLS and satellite transmission. Questions, however, remain. The internet was never designed to handle the requirements of high-load broadcast services and security and quality concerns persistent, and because of this, Arqiva and Net Insight have developed a fully managed, end to end IP contribution service. The new service uses the latest technologies to eliminate the imperfections normally associated with internet grade transport. Called the Internet Contribution Service (ICS), it bridges the gap between the best-effort nature of the internet, and the high reliability and quality requirements demanded by Tier 1 broadcasters. It also offers new opportunities to extend audiences, break into new markets and reduce the cost of transport, claimed Arqiva. Ultimately, the low cost, flexible nature of IP contribution is its key advantage, delivering the kind of business agility broadcasters have been unable to achieve with conventional approaches. They no longer have to ‘commit’ to a region for a minimum period of time (in the case of fibre, this could be as much as three years), or manage limited availability, high cost satellite connections. Multiple endpoint delivery: Broadcasters wishing to move live video content to multiple endpoints around the globe typically use fibre. This is a high cost activity. Using IP contribution and cloud-hosting eliminates the need for high cost lease lines and offers a virtual repository of content to deliver or pull from. Fast start audience acquisition: Establishing services in a new market requires a considerable infrastructure investment, long lead times and long-term financial commitment to the geography. IP contribution gives broadcasters the flexibility to fast trial services without the expenditure or commitments. Addressing niche audiences: Avoiding the high costs and longer term commitments of fibre, internet contribution enables broadcasters to service smaller, cost sensitive audiences more effectively, maximising returns and delivering a greater choice of channels. Disaster recovery and continuity: With customer experience crucial in today’s competitive world, a growing number of Tier 1 operators are choosing to deploy IP contribution as a ‘go to’ channel in the event of problems with existing fibre and/or satellite distribution. Content acquisition: Cable operators are often limited by the feeds available on distribution satellites in their respective regions. By using an internet contribution solution, they are now no longer limited just by the availability of these channels, they can also pick and choose what quality they want to acquire. 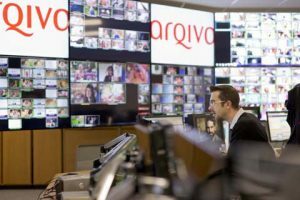 The Arqiva approach offers an end to end media distribution solution that includes IP, satellite and fibre, giving broadcasters reach, flexibility and the choice to use whichever platform is best suited to the business need, the company stated. For those exploring their IP contribution options, Arqiva with Net Insight offer a fully-managed service. At the heart of the solution, the Net Insight Nimbra VA family ranges from an impressive and flexible integrated 4-channel H264/HEVC encoder/decoder to standalone transport and virtual appliances. Each option is built on the same carrier grade platform that significantly enhances the transport properties of the underlying IP infrastructure to assure reliable video transport over the public internet. With security an imperative, each appliance is stringently tested to assure the highest levels of security, with a fully configurable firewall locking down the device and only providing management and video traffic access through dedicated VPN tunnels. The content itself is also highly encrypted using AES 256 encryption. Also, to ensure reliance, a minimum of two ISPs are contracted as part of the end to end management solution. This ensures no single point of failure should one ISP have problems; the other seamlessly takes the load. Concluding, Arqiva noted that as we move forward, and High Efficiency Video Coding (HEVC) becomes the primary distribution for UHD content, customers will benefit from increasingly tighter technical and commercial integration with fibre and satellite products, with all broadcast services integrated under a single, powerful management umbrella.